Those are Mozilla veteran, Asa Dotzler’s words, when being asked about the months before Firefox 1.0 was launched in 2004. After several delays and late night bug fixing sessions, the relief to have Firefox 1.0 was huge for the whole organization. One can hardly believe it has already been 10 years since the revolutionary browser was released, transforming the online experience of millions of users worldwide. However, in the past decade Firefox has also constantly evolved itself, while setting new standards and milestones along the way. Nowadays, you can find Firefox on hundreds of millions of computers, smart phones, and even Mozilla’s own mobile platform, Firefox OS. Before nostalgia overwhelms us, let’s have a look back at 10 of the most important milestones Firefox has reached since its debut in 2004. Something Firefox prides itself on is the huge language support it’s had since the very beginning. Firefox 1.0 launched with support for over 24 languages in 2004, making it the most accessible browser available at that time! As a community-oriented organization, contributors all around the world have chipped in, with the mission to make Firefox available in every language possible. With the release of Firefox 4 in 2011, l10n has hit language support for a staggering amount of 80 languages! As of now, Firefox for Desktop offers support for 88 languages while its Android counterpart has 56. Firefox’s repositories also include over 110 locales. It seems so obvious nowadays to use tabs in order to organize active websites, but browsers widely lacked this feature before the 21st century. Although Mozilla didn’t invent tabbed browsing, Firefox can be credited with being one of the browsers (along with Opera) to bring tabbed browsing to the mainstream. Phoenix (which would later become Firefox) introduced tabbed browsing in September 2002. It is unthinkable nowadays to use a browser without tabs (just think how many separate windows you’d have!). Yes, you can thank Firefox for that too. In February 2014, Mozilla introduced Firefox Accounts, integrated into the Firefox Browser along with various other Mozilla services, such as Firefox Marketplace, Firefox Hello, and of course Firefox Sync. With Firefox Accounts, those and other services can be integrated better into the user’s Web experience. As of now, the potential of the service has not been used to its full extent, however there are plans for various other uses of Firefox Accounts in future Firefox builds. Originally called “Collusion”, the Firefox add-on Lightbeam was released just after the Edward Snowden leaks, gaining a lot of traction and hype towards it. You can check it out for yourself by installing the add-on from the Lightbeam website. By the time Firebug was released in 2006, it had vastly changed the way web developers interacted with web pages. Although now mostly replaced by Firefox’s very own developer tools, Firebug is still widely used (nostalgia?) and also maintained by its original creators. Based on WebRTC Technology, Firefox Hello has been introduced in the beta release of version 34 (and soon to be in the stable release). Hello provides more value to Firefox users by making it easier to communicate with friends and family who might not have the same video chat service, software, or hardware. It’s free to make voice and video calls and there’s no need to download software, plugins, or even create an account. It is not a polished product yet, but the potential it bear is undeniable. Mozilla today announced it set a new Guinness World Record for the largest number of software downloads in 24 hours. The record-setting 8,002,530 downloads coincided with the launch of Firefox® 3, Mozilla’s major update to its popular and acclaimed free, open source Web browser. Tristan Nitot, President of Mozilla Europe, accepted the certificate from Gareth Deaves, Records Manager for Internet and Technology at Guinness World Records, on behalf of the Firefox Community. 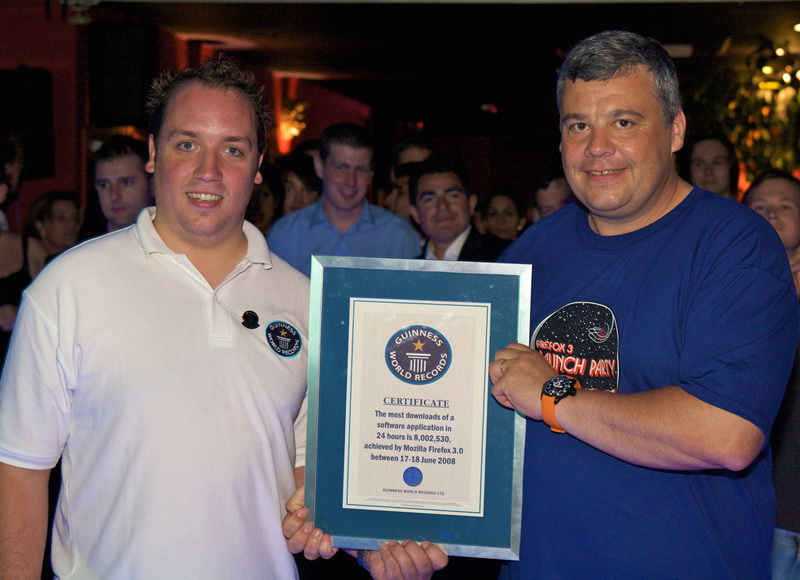 The record achievement certificate was awarded in front of a 300-strong community gathering in central London to celebrate the launch of Firefox 3, and the Guinness World Record feat. Until Firefox 4, every Firefox release would take more than a year to be released, making every one of them a major release. The release of Firefox 4 marked the switch to an 18-week development cycle. Whereas with Firefox 3.6 and lower the development cycle took more than a year between 2 versions, the rapid-release approach (similar to Chrome) was used after the launch of Firefox 4. A new addition in this cycle was the Aurora Build Channel, which would be best compared to Alpha Builds, bridging Firefox Nightly and Beta, in order to offer a more stable experience, which, frankly, makes sense in a faster development cycle. Even a fox needs a haircut from time to time. That was also the idea behind Australis, Mozilla’s effort to refresh the UI and UX of its beloved Firefox browser, therefore turning it into a much more streamlined experience on every device. Since the release of Firefox 4 in 2011, Australis has been the biggest visual update of Firefox yet. It features smoother buttons, a more minimalist approach, and even some nifty new features such as the “Customize” command. However, among the Firefox users were also doubtful fans, who refused the new approach, and often demanded the old look back, comparing the Australis overhaul to the Google Chrome interface. Although it might not have been everybody’s cup of tea, Australis has been well received in the long term, and is now part of Mozilla’s new branding direction. After spending a couple of years known as the Weave add-on for Firefox, Sync had its very own debut in March 2011 when Firefox 4 was released after a full year of development. The service keeps bookmarks, passwords, browser history, open tabs, and other data consistent across multiple computers and devices. However, with the launch of Firefox 29 (Australis) in 2014, Sync has been re-imagined and Firefox Accounts have been introduced, replacing the old Sync from 2011. Note: Worth noting is the fact that you are able to set up Firefox Sync on your own server. Great if you are privacy concerned! Just as this article was about to be published, Mozilla announced “the first browser built for developers”, Firefox Developer Edition. Of course, we can’t say yet if this new product is going to be a milestone, but it certainly looks promising. 10 years later, Firefox still plays an essential role in our internet lives. Regardless of the market share it has, it inspired sustainable innovation, where other technologies might have brought disruptive innovation. What are some Firefox things that made you happy? P.S: I’m delighted to say that I had the honour to lead the design efforts of the Firefox 10th Anniversary campaign page. Yes, SitePoint was practically there when the page was developed! You can check out the anniversary page at www.firefox10.org where you can also get involved by spreading the love!